England were frustrated by Kraigg Brathwaite’s composed century as West Indies had the better of the fourth day of the second Test in Grenada. His 101 not out took the home side to 202-2, a lead of 37. Earlier, England moved their overnight 373-6 to 464 all out, with Joe Root ending unbeaten on 182. On a pitch that remains lifeless, a draw seems the most likely result, lengthening England’s wait for a first overseas win since 2012. If a positive result on the final day is possible, then it is Alastair Cook’s men who are more likely to earn a 1-0 series lead. However, the lack of opportunities created in the turgid afternoon and evening sessions suggest that an attack lacking variety will find it hard to take the eight wickets required quickly enough for a run-chase to be undertaken. “We’ll chase anything, we just need enough time,” Root told BBC Sport. “We have to have a really good session with the ball in the morning. 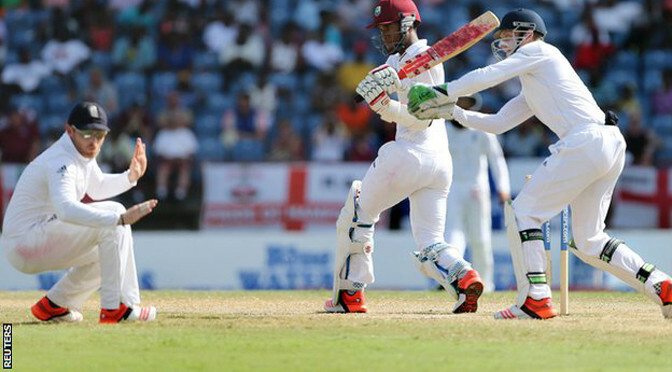 “West Indies need need a lot of credit for the way they played tonight. They were under quite a bit of pressure with lead we had, but they have got themselves back in the game.